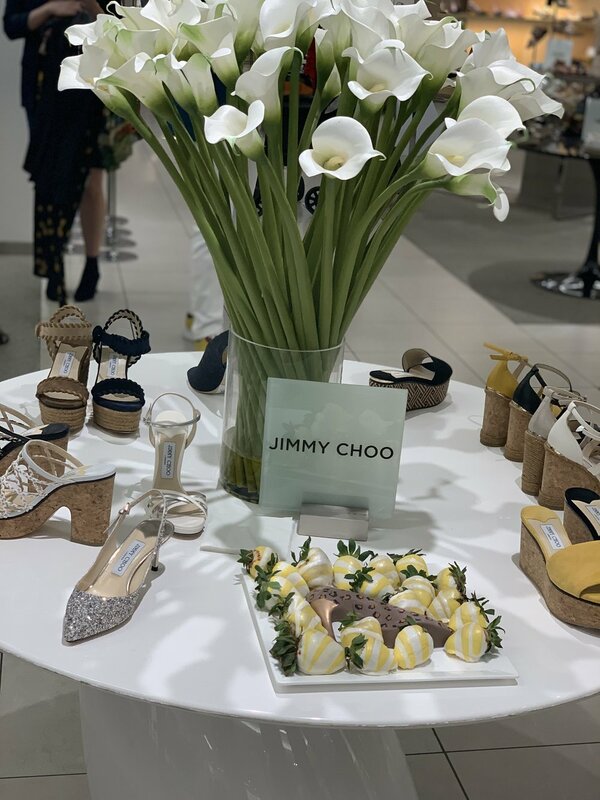 I had the pleasure of attending a Jimmy Choo luncheon hosted by Saks Fifth Avenue to unveil the Made to Order Pop up that will be available in store for a short time. Made to Order by Jimmy Choo is not new, the line was established in May 2014 and is perfect for a special occasion. I considered getting my own wedding shoes designed because there is a plaque you can place on the underside that displays whatever date or initials you want, it’s a great way to commemorate a special day. I ended up going in a different direction because I wanted to be able to see and touch the different fabrics and styles before purchasing. Choosing online was too much of a risk for such an investment; but experiencing the collection first hand in store did not disappoint. The fabrics are beautiful and the shoe styles are classic and timeless. Being able to pick out every detail in store is a really great chance to get your hands on a pair if you’ve been contemplating. The Made to Order line consists of select heels, flats, and handbags. Aside from the Made to Order collection, the legendary fashion house is expanding to ready to wear clothing. The unisex apparel, currently consists of shirts and hoodies and is only available online. I’m excited to see the future direction of Jimmy Choo apparel. - Jimmy Choo director and CEO Sandra Choi. For all the spring and summer brides, will you be saying: “I do, in Choo” ? I had the pleasure of attending a Jimmy Choo luncheon to unveil the Made to Order Pop up that will be available in stores for a short time. 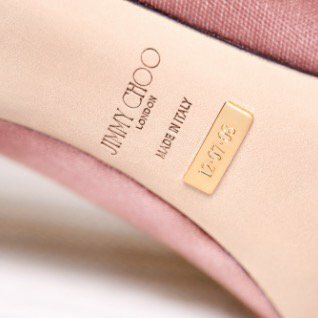 The Made to Order by Jimmy Choo is not new, the line has been available for a while and is perfect for a special occasion. I considered getting my own wedding shows designed because there is a plaque you can place on the underside of the show that displays a whatever date or initials you want, it’s a great why to have a tasteful monogram to commemorate a special day. Being able to pick out every detail in store is a really great chance to get your hands on a pair if you’ve been contemplating. The Made to Order line consists of select heels, flats, and handbags. Spring is a few weeks away and I so ready for warm air, festival season, and a wardrobe change. There are some really fun trends this season I can’t wait to try when winter is officially over, but fo now, here are some Spring 2019 trends that we can start wearing now. We are in the midst of shoulder season, spring is in the horizon and but winter is still trying to told on. Every morning I wake up I have no idea what the temperature is going to be, it’s fluctuating all over the place and this is the perfect time of year to play with layers because the day to (even hour to hour) weather is so inconsistent. One of my go to way to layer is belting a scarf, it’s to functional and versatile. This look add depth to basics and refresh your wardrobe. I finally had the chance to get my hands on SUISTUDIO, the sister company to SUITSUPPLY launched in 2017. Following in the footsteps of it’s big brother, the brand specializes in suits, blazers, jackets, and work wear. The SUITSTUIDO’s contemporary boutique decor is chic and fun, reflecting the fashion forward twist on tailored that I’ve come to expect from SUITSUPPLY. Quality over quantity is my mantra when it comes to my wardrobe and my style. . That’s not to say something has to be name brand or expensive to last or be good quality; but there is something to be said for purchasing quality over quantity. Which leads me to the idea of investment pieces, I choose to purchase quality clothing and accessories as well as bags and shoes, but I do so strategically. I absolutely love the versatility of smoking loafers and sweater dresses because they both can be effortlessly dressed up or down. Depending on my mood I wear this dress with heels to go grab a drink on flats like here for a casual day around town. I have been absolutely swooning over Alice and Olivia for a couple years now. I have been looking to update my wardrobe, particularly some skirts and tops and I stumbled on their end of season sale in the midst of all the online after Christmas/New years online sale shopping I’ve been doing. I didn’t intend on only shopping at Alice and Oivia but the sale is so good! 2018 has been a wonderful year, to see this year come to an end is bittersweet; in 2018 I turned 30, got married, and had the courage to start The Chic Script. I don’t have any big plans for New Years eve, but if you have plans and are looking for an outfit I highly suggest checking out some pieces from For Love and Lemons . Denim on denim is a go to for me all year round. This all blue look gave me the chance to wear my denim Manolo Blahnik Hangisi Flats. and my scarf , I love this scarf because it has a story, it’s a conversation piece and brings the most wonderful feeling of nostalgia. As my style transforms I find myself gravitating to quality craftsmanship, not just big brand names. There are a few times a year tulle is absolutely expected…. Mardi Gras, New Years, and Christmas and will be taking full advantage this season. The Oleander art gallery, located in the heart of the French Quarter hosts local artists. The showcase features various New Orleans artists, most notably Andy Warhol inspired screen printing handmade by Man of Creation. The bold and bright images of Famous New Orleans trumpet player Louis Armstrong, Coffee cans and beignet boxes of the iconic Cafe Du Monde, and contemporary Tom Ford fragrance bottles line the gallery walls. 1 . Invest in a White Coat. 2. Get well made scrubs, with a good fit. 3. Find a work bag you’ll look forward to carrying. About 3 months ago I decided I wanted to add some blonde to my hair color, my hairdresser and I decided to lighten my overall color just a few shades, and then she went in with heavy highlights in a range of blondes from caramel to ash. So I have been using some new products and over these past few months have fallen in love with the Matrix Biolage line of products. I try to get a head start on my gift buying to avoid the growing crowds at shopping centers as Christmas day approaches. Here are the stocking stuffers I’m obsessed with categorized by the near and dear friends we all have that will appreciate them the most. The Ordinary Brand | Still anything but Ordinary? The brilliant thing about this cosmetic line though is the price point. The cost is really good, instead of added fluff and fancy packaging The Ordinary gives it to you straight, some of them I enjoy, most of them not so much. The dark slowly turns to light, the quiet streets fill with cars, and the hustle and bustle of another beautiful day begins.